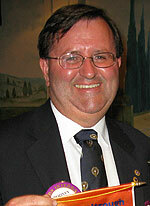 I had the pleasure to attend the 50th Anniversary of the Charter of Northcote Lions Club in Victoria last year. The proud motto on the night was ” Chartered 1st December 1962: Still Going Strong”. Congratulations to the organisers for a fun and memorable night. It was a wonderful venue, great service and food, good company and minimal fuss and ritual. It is usual at Lions functions, particularly these sorts of celebrations, to recite the Lions Purposes and our Code of Ethics. The language is a little old fashioned, but they really do remind us why we are all here, working alongside each other to improve our communities, so it is worth listening. There is also an “Invocation”. Merriam-Websters Dictionary describes an Invocation as: “the act or process of petitioning for help or support” It’s a call for authority, often a prayer – but not necessarily so. The Chairperson got my attention when he announced that the Lion reading the Invocation was the grandchild of the Lion who read the Invocation back in 1962. What a nice touch! When Len Hales read the Invocation in 1962, it was obviously more than simple words to him. He passed on his desire to do great community service to his son, and ultimately his grandson Rodney, who was there on 1 December 2012, reading the Invocation on behalf of his Lions Club. We, as Lions, ought to be talking to Rodney Hales, and people like him, about what makes this magic happen. How do we pass on our love of volunteering and community service to those people close to us. Rodney shared a little insight in an e-mail to me, about his grandfather, who’s service extended well beyond Lions, and about his club. “Len Hales was my grandfather who migrated from England prior to 1921. He was Mayor of Northcote 1947-48, 1954 -55 and 1963- 64. Both Len and his wife Florence worked tirelessly for their local community. Granddad was also on the board of management of the PANCH hospital from inception till he was struck down by stroke in the mid 80s. Saturday was a very happy event for all in the club. I was very glad many were able to attend this important occasion.